Global Tech Giant - Casio India has announced the release of a new addition to its EDIFICE line of high-performance metal chronographs based on the brand concept of "Speed and Intelligence." 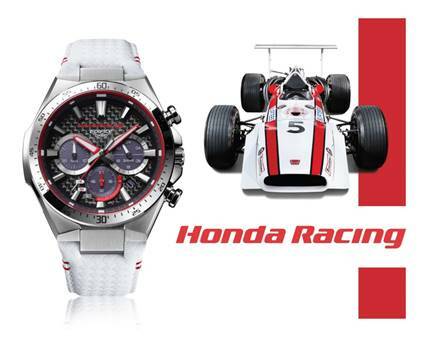 The new model of Casio Watch EQS-800HR is a launched in collaboration with Honda Racing. This Casio EQS-800HR is a solar-powered and water resistant Watch model with resistance capacity upto 100 metres depth. Its light in weight model that boasts a dial made from Carbon Fiber, a material indispensable in motorsports. The overall watch design adopts the red and white image colors of Honda Racing, highlighted by a white leather band with red lining. 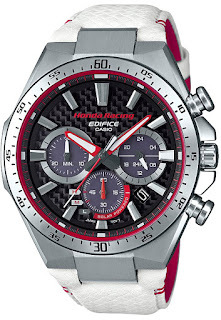 The dial features the Honda Racing logo, and the strap keeper and back plate are engraved with the Honda logo. The premium watch comes in special packaging that includes a card commemorating the 1968 Honda F1 RA301 race car. Honda Racing is the motor sports activities that Honda Motor Company, Ltd. pursues around the world. The Company has been in the spotlight as the supplier of power units to the Scuderia Toro Rosso Formula One team, for which Casio EDIFICE has also been a supporter since 2016. The collaboration between Honda Racing and EDIFICE, both of which have origins in Japan, was born from their common pursuit of high-tech capabilities. 1-second stopwatch; measuring capacity: 29'59"